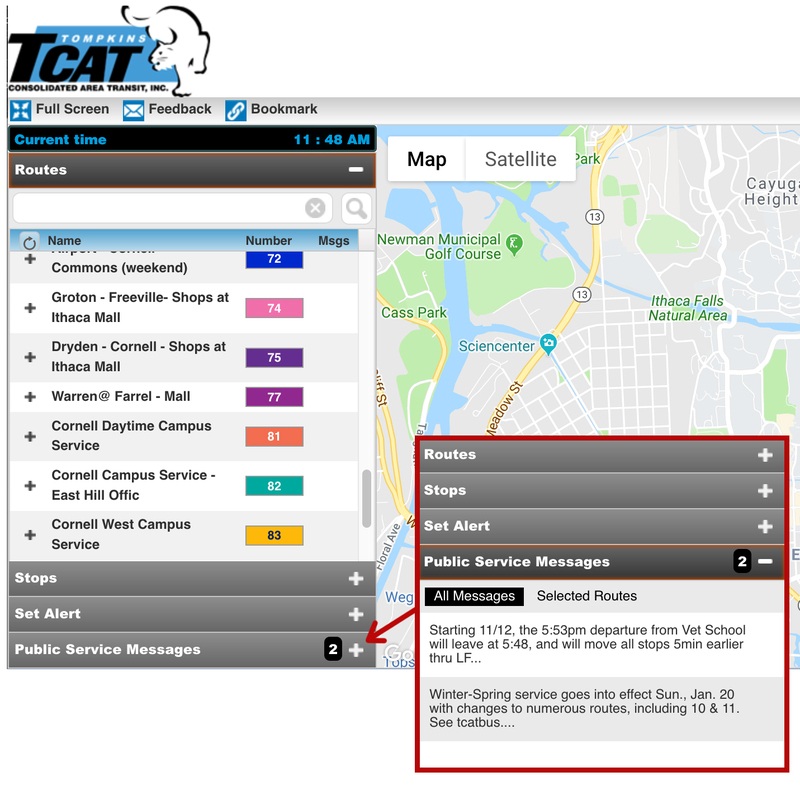 To be prepared for some of those usual “problem” areas, TCAT has pre-established snow detours for Routes 11, 14, 14S, 36, 51, 92 & 93. These snow detours go into effect when winter storm conditions prevent TCAT from safely traveling certain roads. When significant snowfall or ice makes certain sections of the route impassable, the route will be put on a snow detour until conditions improve. Snow detours are put in place on a route-by-route basis. Route 11 cannot serve Hudson St., between Grandview Rd. & S. Aurora St. and will reroute onto Aurora St. (96B). See Rt. 11 snow route map here. Route 14 cannot serve Chestnut St., and Campbell Ave, and will reroute onto Elm St., Hector St. (NYS Rt. 79) and Trumansburg Rd. (NYS Route 96.) See Rt 14 snow route map here. Route 14S cannot serve Chestnut St., and Campbell Ave, and will reroute onto Elm St., Hector St. (NYS Rt. 79) and Trumansburg Rd. (NYS Route 96.) See Rt. 14S snow route map here. Route 36 cannot serve Lake St, between University Ave. and Falls St., and will reroute using Stewart Ave., downtown and Cayuga St. See Rt. 36 snow route map here. Route 51 is unable to serve Snyder Hill Rd: Skyvue Rd., and Eastern Heights Dr. See Rt. 51 snow route map here. Route 92 cannot serve the eastern side of University Ave., Stewart Ave. and Thurston Ave., and will reroute from West Ave. to University Ave. See Rt. 92 snow route map here. Route 93 cannot serve the eastern side of University Ave., Stewart Ave., Thurston Ave. and will reroute from West Ave. to University Ave. Route cannot serve Eastern Heights Dr., Skyvue Rd. and Snyder Hill Rd. See Rt. 93 snow route map here.